We’re down to the final phase of drywalling, and it’s a crucial one: skim coating. Crucial because, ironically, it’s not even one that’s required, but it is one you shouldn’t skip if you want a truly professional finished product. Finish levels 0, 1 & 2 as defined by the Gypsum Association—a not-for-profit trade association that promotes the use of gypsum while advancing the growth and general welfare of the gypsum industry in the U.S. and Canada—are walls that are fine for limited viewing, such as garages, attics, and unfinished spaces. Level 3 is one that will require plenty of texturing to hide seams, and Level 4 is a wall that has smooth seams and will appear flat after it’s been properly painted. But for the ultimate fine finish—a wall that has no sign of seams and that will appear flat under close inspection and in a variety of lighting conditions—you’ll need to go to Level 5. It’s a time-consuming process that requires application by hand of one or more thin layers of joint compound applied in what’s referred to as a skim coat. 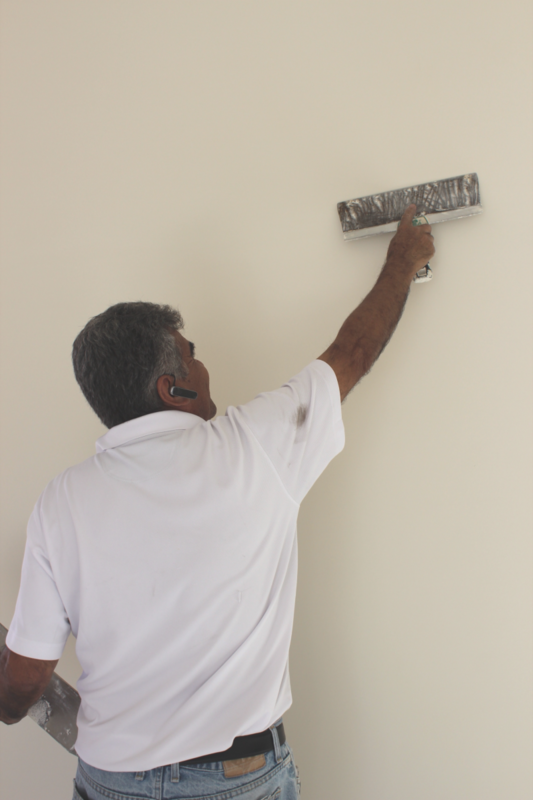 With his several decades of experience, Jose Luis of HH Drywall moves with precision and a deft touch, working with a hawk and trowel to apply a consistent, thin layer of compound. Custom Design & Construction's Sheldon Street is a big job, so today, he’s joined by his wife Rosanna and another experienced worker. Sanding is required between and after the final coats to remove any tool marks and imperfections. It’s also critical to allow layers to dry fully, and because we’ve had some recent rain—unusual for this area at this time of year—there’s moisture in the air, so drying will take longer than usual. But the finished product is well worth the wait.